With the occurence of technological evolutions, we usually think about smartphones, computers, and similar gadget. However, if you take a closer look around your home, you will notice that almost everything else represents technological evolution, from refrigerators, LED lights, washing machines to dishwashers, among others. And if you love to spend time in the kitchen, you will definitely love something that will make your work easier. Installing kitchen faucets comes with numerous benefits. First, your kitchen will not be messy, which means an occasional cleaning will be sufficient. Second, it will make your work around the kitchen easier, thus saving you time. Third, most of them come with a soap dispenser, which takes care of hygiene issues around the kitchen. Most importantly, these faucets are highly effective in saving water. As you can see, it is something that you should consider installing in your kitchen. Here is a list of the best touchless kitchen faucets and what they can do for your everyday life. Moen has established itself as one of the most reliable manufacturers of home accessories. It’s available in three variations – oil rubbed bronze, chrome, and spot resist stainless. All the variants are resistant to water spots and fingerprints. Therefore, a simple cleaning process is enough to maintain its freshness. Just like other faucets in this category, the product comes with a lever that makes it easy to control water temperature and pressure. When one looks at its features, it offers the value that comes with its price tag. It features two motion sensors – one below the spout and one located at its top. The motion sensor at the top sends your hand movements, and then starts or stops water accordingly. The sensor fitted below the spout detects the presence of objects. Once you place pans under the spout, it will immediately trigger water to flow out of the faucet at the desired pressure and temperature and then stop when you remove the pots or pans. Therefore, you have the convenience of using this faucet without touching it, thus making your work faster and easier. 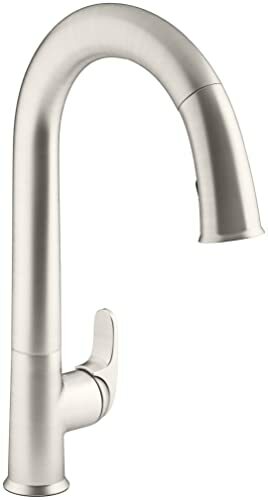 It has unique features of a conventional kitchen faucet. For example, you can extend its spray head up to 68 inches in various directions. Its reflex system is equally effective. It features two spray modes – flow and spray. You just need to turn on a switch to adjust the spray mode. The aerated spray is highly reliable and does cleaning tough things while the flow pattern is best suited for filling things. With its excellent style and design, plenty of features and ease of use, you have more than one reason why you should install it in your kitchen. This kitchen faucet takes touchless technology to a whole new level. It combines functionality and elegance, then you don’t have to look any further. This Kohler model delivers that and much more. It looks great and even performs better than most of its competitors. With its simple but sophisticated design, It will fit perfectly in almost all modern kitchens. It’s available in 4 exciting colors including accents, pure, vibrant stainless, and polished chrome. Its sense technology is able to respond within 20 ms, which is the fastest reaction time among touchless kitchen faucets. Some touchless kitchen faucets have been accused of false activations, but this is not the case with this model. It features an inbuilt activation-precision window, which prevents such issues. Also, the product is AC powered, which means you will never need to get worried about recharging. It uses magnetic docking technology to lock the spray head in its position. You will also notice that its nylon hose follows your motion instead of forcing you to assume uncomfortable positions or twists, which has always been a problem with older faucets. What makes it truly unique is that the spray head is also responsive to sensors. Therefore, you will enjoy a touch-free experience, making it highly convenient for a busy kitchen. This is an expensive installation for your kitchen. On the brighter side, you will enjoy the services of a faucet that will serve you for many years to come, without any issues. However, in case your taste is a more expensive model, a budget-friendly option among those expensive models, then you should consider purchasing this product. It comes with all the modern features at an affordable cost. 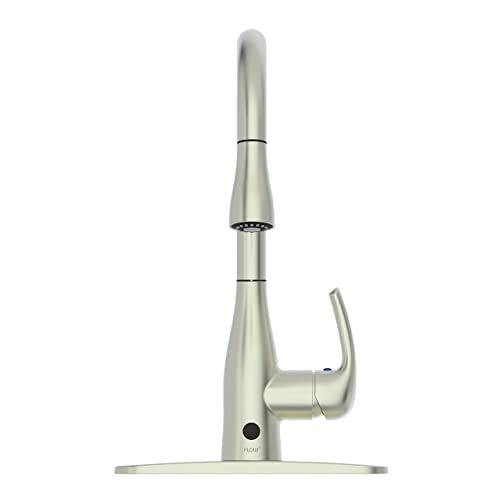 The body of this chrome kitchen faucet is made of durable metal, which makes it highly durable. It can endure all forms of abuse in the kitchen without developing scratches or other forms of surface imperfections. It’s also easy to maintain since its polished chrome finish doesn’t allow water to settle on its surface. Also, since it’s touchless, the chances of it becoming dirty are slim. Its motion sensor is located close to the lever. Therefore, you can activate it easily by placing an object under the level or simply waving your hand. Its sensor is highly accurate. Since batteries power it, no hardwiring or additional accessories will be required. Also, its gooseneck has a high arch, which gives you ample space to perform your cleaning and washing tasks. In addition, the product is versatile and it allows you to pull and extend the spray head when you are working. With easy installation and motion sensor technology, this product provides a budget-friendly option for those looking for an ideal faucet. The product features a deep sink which makes it an attractive and ideal option. It is highly resistant to scratching. Therefore, it’s able to retain its classy and elegant condition throughout its lifetime. Also, its coating is easy to clean. Apart from that, its brushed nickel finish ensures ultimate water resistance, which means your faucet will not corrode due to water drops. It comes with a sensor-activated pull-down sprayer, which is easy to use. Children can use this faucet with minimal effort. Its motion sensor is located at the front of its base. It automatically detects any motion or movements consequently triggering water flow. The sensor will then turn off the water flow automatically, once the movements stop. It’s also smart enough to detect people or pets moving by. One of its biggest benefits is the ease of installation. You can easily install it on your own without any professional assistance. You can also use it as a standard faucet, more so when cleaning your kitchen. 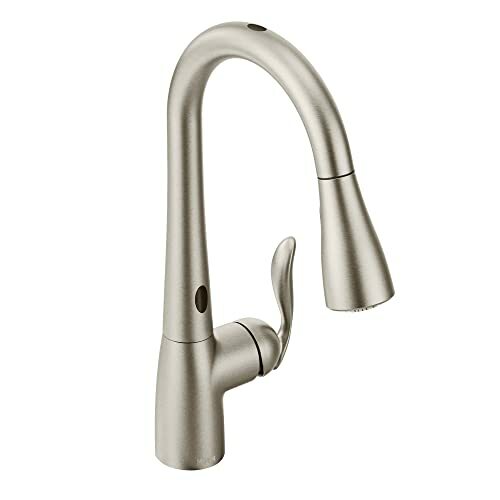 With its smooth lines, high arc and futuristic design, this kitchen faucet adds elegance to any modern kitchen. The product is a perfect blend of features and looks. Easy installation, hands-free operation, and flawless performance are among the reasons why this product is hard to ignore. Its motion-sense technology delivers a hands-free convenience. Once you position your ands close to the sensor, water flows automatically – perfect for a quick drink or washing utensils. The water will also stop when you remove the hands. Just like other faucets from Moen, It comes with reflex technology, featuring a spray head and a flexible hose, which reflex easily and fully. Its neck has a high arch, which gives you plenty of space to perform your kitchen chores. As previously noted, you can extend its spray wand for added convenience. Its spray wand allows you to change the mode from spray to flow and vice versa. Its aerated spray is great for tough cleaning jobs while the flow is suitable for the regular application. Its spot-reist stainless steel finish thus keeping it clean at all times. As a bonus, it features a the proprietary allows easy installation with water lines. The list above features some best products currently on the market as far as faucets are concerned. Installing any of these will make your work easier in the kitchen. Also, you will enjoy doing the dishes and cleaning the vegetables. Most importantly, choose products based on your budget, its durability, available space, design, power consumption as well as features present. The above faucets may be expensive than your ordinary ones. However, they are worth your money, and you will no longer have to think about kitchen faucets anymore. Generally, cost should not be the only consideration when making such critical decisions. At the same time, a product which is expensive does not easily translate to high quality. The best thing is to strike a rational balance between cost and quality.